Published April 2, 2018 By Leisa Good This post may contain affiliate links. Regardless, I only recommend sites I've researched and/or used and trust. Do you enjoy working from home and have a passion for travel? Are you ready to help travelers select exotic destinations around the world? How would you like to work for a company that has been in business for 140+ years? 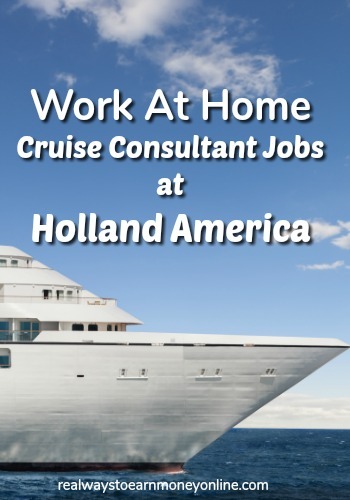 Then maybe becoming a cruise consultant for Holland America might be a good fit for you. What Exactly is Holland America Line? Holland America Line, or simply Holland America, is a cruise line with one of its main offices located in downtown Seattle near the popular Elliott Bay. The corporate office manages a fleet of 14 modern cruise ships and launch approximately 500 cruises a year- to all 7 continents. If selected, you would be working from home as a salaried employee with benefits and paid time off, including holidays. Even though you would be working from home, you'd still have access to team members and management to help with any support issues that might come up. Hires are typically required to attend monthly sales meetings. Holland America Line also believes that travel can be life transforming and operates with a corporate mission of bringing one of a kind travel experiences to each guest. They also support a number of charities and were recognized by the Puget Sound Business Journal as one of the 25 largest corporate philanthropists in the Puget Sound area. What Does a Cruise Consultant at Holland America Line Do? You would basically be doing the job of a travel agent with a focus on booking cruises. While this is a travel agent position, it is also a sales job with quotas to meet. If you do not like sales or shudder just thinking about sales, this may not be the job for you. You will also be responsible for building brand loyalty by offering exceptional customer service via outbound calling. What Are the Hours and Pay at Holland America Line? The hours are what is called 9/80, which consists of eight 9-hour days, one 8-hour day and a day off in a 14-day period. The 8-hour day is usually split into two 4-hour shifts. They have both day and night shifts and also schedule shifts over holiday periods. The pay seems to vary from $10 to $15 an hour with more cruise consultants earning at the lower end of that before commissions. Training is also paid and ongoing. What Are the Requirements to Work at Holland America Line? Do not let the one year of experience with Holland America Line keep you from applying. If you already have at least one year of experience working for another cruise line, I have heard of people getting accepted. Unfortunately, you will still need to live in one of the four states mentioned above. What Are the Employee Benefits of Working at Holland America Line? What Do Others Say About Working at Holland America Line? Glassdoor gave them a 2.9 out of 5.0 star review, with most agents enjoying the work, but complaining about things like the pay not being competitive enough and the company's computer systems being outdated. Indeed gave them a 4.1 out of 5.0 star review with more remote agents appearing happier, but with similar types of complaints. It is always a good idea to check company reviews on any work-at-home company or otherwise at Glassdoor, Indeed or Reddit. How Can an Interested Applicant Apply to Holland America Line? While they do have their own website, most of their work-at-home jobs are posted on Indeed or LinkedIn, so be certain that you have free accounts with both of those. If so, consider investing in a subscription to FlexJobs. They list many work at home and flexible job leads five days per week, guaranteed scam-free. You can use promo code AFFILPROMO to get 30 percent off your membership. It's very easy to cancel if you don't like it.